Alright, so I know, I know, it's been way too long since I've been on my blog. I can't believe how much time this blogging stuff takes. 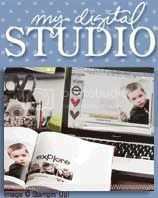 I'll keep this post brief and let you know that I purchased My Digital Studio from Stampin' Up in November and played with a little bit when I was home from my foot surgery, but since then, I've really been able to sit down and play, play. 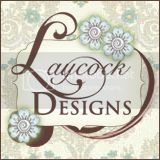 Check out some of the cards I made this weekend. 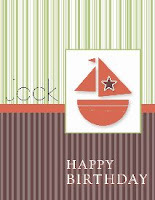 Peter's nephew's 2nd birthday is next weekend and you know how it is with kids, they won't remember for a minute what cards they got unless the parents keep their cards, so my first thought was this would be a cute card to create digitally and I don't have to spend a lot of layering and cardstock on. Well, while creating this card, I found out how to create a blank page and copy elements from my card to a blank document and then I can cut that element out and put a dimensional under it and raise it up. Such as the boat. There is also a feature on MDS (my digital studio) where you can put a shadow on an image and the computer makes it look like it's raised right off the page. I think I'm going to teach a class so you can all see how great this program really is. Don't misunderstand me, I have PSE7 (Photoshop Elements 7) and that is a very powerful program, but MDS is so incredibly user friendly and with a few lessons, you could be on your way creating cards right on your computer. I should add a disclaimer and say that I was worried if I started creating digital cards, then what do I do with the enormous amount of "stuff" I already have. Well believe it or not, I have found that I am actually using more little embellishments than I ever did before because now it's just a matter of tweeking it with a little bling. The star on the boat in the photo, Chris & I had bought these little viales of stars, flowers and paperclips, probably more than 2 years ago around halloween, I may have used 1 or 2 here and there. Well one of those little crystal stars worked great on my little boat. And I printed out another boat, copy and pasted onto a blank page, and walla - I have another boat to cut out and layer it on top of the digital boat. 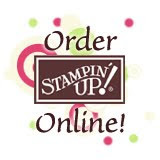 You guys have gotta see this amazing product Stampin' Up has come out with. Here's a couple more pictures of cards. 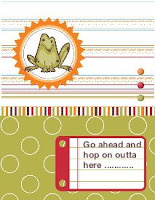 1st one is a going away card for my cousin and her husband that are leaving for Memphis, TN next week. The 2nd one is a 50th birthday card for a friend at worked that ordered one. The candle is from Big Bold Birthday stamp set and I just cut, and pasted until I had 10 across, highlighted all 10 and created a grouping and then copied and pasted that grouping 4 more times to create 50 candles on his cake. Gotta love that! I'm going to head to my craft room right now and spoof this one up. Check back for more this week. This is very addicting. Thanks everyone for being loyal and still checking out my blog.